Briarwood Arikik v Exacta (AKC Baron), CD, CDX, RN, RA, RE, CGC went to the Bridge Monday, January 14, 2019, at 6:30 p.m. I am shattered and heartbroken beyond words. He battled DCM for 8 long years and was doing so good. We had our appointment Monday with Dr. Goodwin, his cardiologist, for his checkup. This was the first time his echo was not good. It was over 25% worse and his heart was showing signs of enlargement. He was throwing PVC's during the echo which he never did before. Dr. G. added two more meds and upped his Pimobendan another 10 mg. So we holtered him and came home. He had a cheesburger on the way home. He was fine. He jumped out of car, peed, ran around a bit, came in and drank water and ate his afternoon meal, played with his toy. He laid down under hubby's legs which was one of his favorite places. He loved having hubby lift his legs up so he could crawl and position himself so hubby's legs draped over him. I was sitting next to them on the computer. He slept there for about 45 minutes and at 6:30 he let out a little cry and I went over to him and asked "what's wrong buddy" and he left out another cry, voided, and was gone. I tried CPR but he was already gone. Sudden death sent him to the Bridge. We have sent the holter back to Dr. G. and his tech Kristi who have both been with us on this journey for 8 years. Hoping they will gain some knowledge of what event occurred at that moment and before because I am sure it is rare to have a dog holtered when they have an event like this. Baron came into our lives as a rehome at 13 months from a woman that was going to show him but ran into financial problems. He was the easiest dog to train and had the easiest, laid back personality of any dog I know. He loved everyone and felt everyone in the world should always come and pet him. We had him for 11 short years on December 29, 2018 and I also have been on DT for 11 years. Because of DT, I gained some much knowledge about health testing and DCM and had him tested early enough that we were able to start meds to help keep the disease in check. The journey was amazing. He is the first dog I ever did any competition with and we had so much fun and met so many nice people along the way. He loved to eat up until the very end. They always say when they are not feeling well they won't eat. Not Baron. Eating was his thing! Another favorite past time of his was watching at the windows of the sunroom. He could see everywhere on our property and spent hours watching out his windows. He had quite a FB following because of his collar and coat collection and the photos we posted. I am overwhelmed by the outpouring of condolences and messages from his fans. The grief right now is unbearable but I have so many wonderful memories, photos, and videos of him that I will cherish forever that will help. I miss him following me into the bathroom, sitting in the kitchen waiting for some kind of snack, our walks, playing with your Go Dog balls, your wonderful singing to the Big Bang's soft kitty song among others, your regal look but then you had your silly moments, and I could go on and on for there are so many things I will miss forever. Sleep softly my sweet boy and know how much your mom loved you! dobebug and Coco Loco like this. Lois, my heart is broken for you. I have "known" you and Baron since I've been on the forum....you've been my friend, a kind ear, a good support in bad times, a colleague, someone I look up to and admire. I feel like I know you and Baron, though I never had the pleasure of meeting him in person. I will grieve his loss, as I know many on DT will. My thoughts are with you in this terribly difficult time. He was a loyal, steadfast Doberboy to his loving caretaker family. I was comforted you know Baron passed quickly, in the presence of those he loved the most. Hopefully, his battle and experiences with the dreaded DCM disease will help future Dobermans conquer this scourge. If only all Dobes could live a long a life as Baron did. Thanks for you & Baron's contribution to DCM research. We'll miss Baron immensely on the DT forum and we're hoping you might find some time to post a short pictorial tribute to him. I'm so very sorry. I only know you through DT, but I've gotten quite fond of Baron, and enjoyed seeing your pictures of him. I am sad for your loss and deep down can see the fortune you had to live with royalty for all those years. Thank you for sharing so much about him . Oh no!! He's been such a fixture on this forum; I feel as if I knew him personally. The pictures and especially the caption on your post made me cry a little. Kip went the way Baron did, almost in his sleep. At least that is one (small) comfort; he sounds like he was feeling well and active and went quickly, without having to deal with lingering pain. Not that that helps much right now. I'm so sorry. I wish there was something more that I could say to help you feel better. I came to know you and Baron through DT. I am so sorry for your pain and the loss that you going through. RIP Sweet Baron. Very sorry to hear about sweet Baron’s passing, from your stories he sounded like a stunning example of our beloved breed. Rest In Peace and run free sweet boy. I was on the phone talking to DOR in Indianapolis when I started reading this post , I knew where I was headed to but could not stop reading about this very special Doberman - Our best friend Baron - the lady had to put me on hold - said it would be for maybe 5 minutes , thank God - Trust me - it took me that long to stop crying . 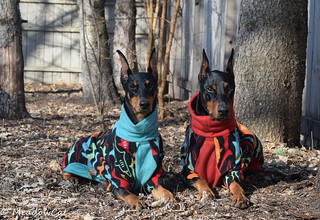 As MC stated - We are all heart broken -- I remember very well - when I joined this great site that Lois posted up some pictures of Baron - I told my wife - oh come here - you have to see this picture of this Doberman ! She looked and said WOW - What a great looking boy - I laughed and told her his name - she looked again and said - It's very fitting ! He looks of Royalty and he was ! I have looked at lots of pictures of him - Like someone said - It was like I have meet him before - I rubbed his ears or tail head - That may sound weird - but that's how I feel - I think it was from the way the pictures were taken - as though he was here or I was there . Oh my..... I am so sorry for your loss. Oh how my heart aches right now......go take care of our pups Baron .........run free. Like Meadowcat, I've been following Baron by post and picture since he first arrive here. My heartfelt condolences on your loss--they are really never with us long enough--no matter how many years we have their company. I'l be thinking of you and Baron will be in my thoughts and those of many of the members here. Go Baron, go where all the good dogs go, be well and happy even thought we'll miss you. ECIN and LadyDi like this. Dax... I am truly feeling your pain. Yet, I am also feeling your comfort with respect to Baron's life's journey given the odds against him. What a fabulous dog. In my opinion he and you beat this f***ing disease, the bane to our chosen breed. I can only hope for the same with my boys. The remembrances and eternal fondest that you both will cherish forever is priceless. To Baron... Run free. Live free. When you run into my boys... Say "Hi". They will be your friends. I have to go get a tissue now. I can't see to continue typing. I have been thinking about you all day, Lois. There are no words and for that I'm so very sorry. I felt like Baron belonged to all of us. He added to much presence to this forum. Such a loss, but such a joy. RIP cool Baron. You set the bar so high and carried it with dignity. I know I've already posted my condolences on FB, but I will say it again here. I am so sorry for your loss of Baron - he was a very cool dog, and very lucky to fall into your life. He had a much longer life than he could have expected due to your excellent care of him and the DCM he was diagnosed with. I'm so glad that you were right there when he went - I'm sure it was quick and relatively painless for him. I've been through the exact same thing twice so I know how it goes. We are so shell shocked when it happens, but eventually thankful that they did not suffer. Hugs to you and your husband - I know your home must seem so empty without him. I also feel like I have come to "know" you and Baron, though I have been on DT for less than 5 years. I am heartbroken for you - please know you are in my thoughts and I send much love. Lois it is terrible to hear this. He beat DCM for so long. I often felt he was the poster child for it- a great and long life even after diagnosis. I do hope the monitor will bring some help to someone else in the future. Every little bit of information helps fight it- I like to think. I am so very sorry for your loss. As others have said, I have come to know Baron also. I felt connected because my first girl dobe was from Briarwood. I also believe the superior care you gave him added many years to his life. Bless you and may time make his passing more bearable. My eyes are full of tears. RIP you beautiful dog. Lois Many of us know your pain and are grieving with you. Be well. Oh Lois...I'm so very sorry. I am so sorry to hear this. I know exactly what you mean about not having anyone to follow you around the house because it's almost a month that Coco has been gone. You were both so lucky to have found each other and shared such wonderful years together. You took such good care of your handsome fellow. Baron will definitely be missed by all. So sorry for your loss Lois, My thoughts are with you in this difficult time. Oh no, I was hoping my eyes were deceiving me this early in the morning...I am so, so, sorry for your loss.